Stacey Zhang is a relatively new Montreal fashion designer. She makes beautiful and structurally interesting womens pieces, each in very limited quantity (which is fun because you know you're buying something original). She also uses sustainable fabrics like linen, silk, organic cotton and bamboo in her collections. And the best part of all, the clothes are actually made in Montreal. 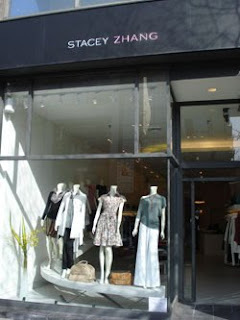 In an age where we can find designer-like fashion at too-good-to-be-true dirt cheap prices (of course at the expense of sweatshop labor across the ocean), stores like Stacey Zhang are a refreshing and reassuring change. The boutique also sells unique accessories that the designer hand picks along her travels in Europe and Japan.